Yes, that's me!! I started this morning with the intention of catching up with one of my least favourite jobs which is preparing and putting inserts into cards, then popping them into cello bags with envelopes. A very necessary job I know but one which I tend to leave until there a pile to deal with rather than finishing off as I go along. As the title suggests I did become sidetracked and started playing around with a technique for using an embossing folder to emulate the letterpress effect. I brayered some ink onto one side of the folder, then stamped a house scene directly onto the folder before popping in a piece of watercolour paper and running it through the machine. Magic - the house is now peeping through the birch trees!! 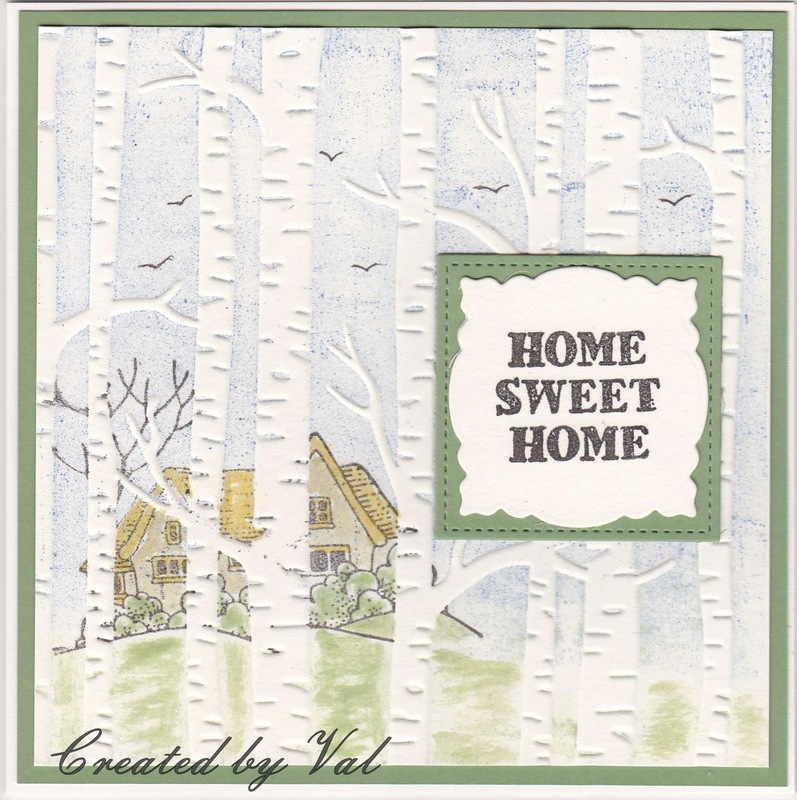 I coloured the house and bushes with Distress markers, drew a few birds in the sky, added a sentiment and here we have a New Home card. I can see that this technique has many more possibilities and is one which I will be using again I'm sure. Incidentally I have now printed off all the inserts I need and I REALLY am about to finish off what I meant to do today before I do anything else. I've even done an insert for this card and the ink is hardly dry - how good is that? I Love this technique Val its so easy yet so effective..love your cottage on the hill behind the trees...well at least you've print off your inserts.. Fantastic Val, I love the technique and the stamps you've used too. It make a great New Home card. Fabulous card Val I love that technique. I'm sure the recipient's wonder how we achieve it! I had to read this carefully as I want to use your technique of stamping on to the folder - if you don't mind! I think it works so well, a cottage in hidden in the trees. I love it!